DartmouthCollege graduate and former Sun ValleySkiSchool instructor/director John Litchfield died June 10, 2011 in Denver, Colo. at age 93. 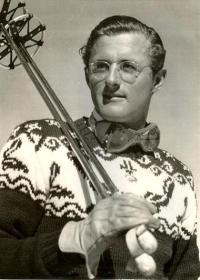 Litchfield became Sun Valley’s first non-Austrian ski school director when he succeeded Otto Lang in that position in 1950. Previously, from 1940-42, Litchfield had served as a ski instructor at Sun Valley, Idaho before joining the 10th Mountain Division to train at CampHale in Colorado. Litchfield helped build Aspen, Colo. into a premier resort and was inducted into the National Ski Hall of Fame in 2009. He is also an honored member of the Maine and Colorado Ski Halls of Fame. Born in Lisbon Falls, Maine, Litchfield was raised in Auburn, Maine and skied from the age of four. By high school he was an accomplished skier. He was one of Zeke Dwelley’s earliest skiers and was a member of the Edward Little ski team that won the 1934 Maine Winter Sports Championships. In the early 1930s he competed and won in all disciplines, jumping, cross country and alpine. He was honored by the state of Maine as the best junior skier in the state. John’s success continued at Dartmouth where in 1939 he earned an economics degree while winning awards in ski events. In 1937 he was a member of the first U.S. Alpine Ski Team at the Pan American Games in Chile. He was then chosen to be a member of the U.S. FIS team competing for the World Championships. He was named to the 1940 U.S. Olympic Ski Team but missed out when those games were canceled by World War II. After Pearl Harbor he was inducted into the U.S. Army at Hailey, Idaho. Capt. John Litchfield served in the famed 10th Mountain Division from 1942-45 earning a Bronze Star during the Italian Campaign. Following the war John returned to Colorado where he became one of the original incorporators of Aspen. Along with fellow 10th Mountain veterans Freidl Pfeiffer and Percy Rideout, he started the AspenSkiSchool where he became a co-director. In 1947, Litchfield and partner Tom Kelleher built and operated the famous Red Onion Restaurant in Aspen. In 1945-46 he served on the Denver Chamber of Commerce Committee to develop winter sports in Colorado. He continued to compete, in 1947 placing first in slalom, seventh in downhill and third in Alpine Combined at the championships of the Southern Rocky Mountain Ski Association. He continued to race Masters events until 1987, at age 70. Litchfield was actor Jimmy Stewart’s skiing double for the movie “Mortal Storm.” In that movie Litchfield skied down a mountain, chased by Nazis. Leaving Colorado in the late 1940s Litchfield returned to Sun Valley where he progressed from ski instructor to chief instructor. He then succeeded Lang as ski school director when Lang moved to Hollywood in 1950 to become a film director. That phase of Litchfield’s life was interrupted by a recall to active duty in the Army during the Korean War. He served as an intelligence officer at the Pentagon. After the Korean War he put his economics degree to work as sales and marketing director for Outboard Marine Corp., manufacturer of Johnson and Evinrude motors and Lawn Boy mowers. He settled in Denver in 1975 to work as a real estate broker. Throughout his skiing and professional careers Litchfield volunteered his time and efforts serving as president of the Rocky Mountain Chapter of the National Association of the 10th Mountain Division, a national association board members and a board member of the 10th Mountain Hut System. Survivors include a cousin, niece and two nephews. Three of his marriages ended in divorce.